Snowshoe, a male hybrid lynx who lived at the High Desert Museum for nine years, died last night, November 10, 2014. He had been under a veterinarian’s care recently for kidney failure. Snowshoe’s exact age isn’t known but it’s believed he was in his 20s, having lived much longer than lynx do in the wild. Snowshoe came to live at the Museum in 2005 after he was found, in poor condition, by a Pacific Crest Trail hiker near Castle Crags State Park in California. David Osborn was hiking the Pacific Crest Trail when he came around a corner on the east fork of Sulphur Creek and spotted the lynx on a sandbar. At first, he thought it was a big house cat. But as he neared, he realized it was much, much bigger than that. Osborn retreated behind a tree but the cat followed him. When another animal, possibly a deer, snapped a twig nearby, the cat became distracted and Osborn fled. He ran several miles and encountered off-duty Park Ranger Christopher “Brett” Mizeur. Mizeur says that when Osborn told him he had seen what he believed was a lynx, Mizeur thought “he doesn’t know his cats”. Mizeur went back to town to pick up a large dog trap and roast beef. The men then returned to where Osborn first spotted the lynx. They carefully formed a trail of roast beef mounds between the cat and the trap. The hungry lynx fell for the trick, wolfing down the piles of beef as it walked directly into the crate. “Then he went crazy”, according to Osborn. “He bent the metal”. The men found large branches to weave through the crate and carried the lynx back to the Mizeur’s truck. ]Ranger Mizeur contacted Marianne Dickison with Shasta Wildlife Rescue and delivered the lynx to her. She took the cat to a veterinarian, who discovered the lynx had been neutered, declawed and its canine teeth pulled. The vet also said he lacked muscle, an indication the lynx had been kept in small quarters such as a crate for a long time. It was clear he had been kept as a pet and then released in the wild to fend for himself. 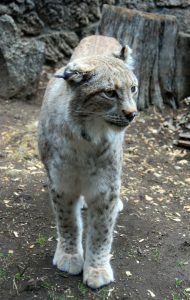 Because the lynx was a protected wildlife species and illegal to possess without special permits, the options in California were to euthanize him or find a suitable home, which wouldn’t be easy. But Dickison was determined not to let the lynx be euthanized. She took the cat home for a week as she searched for an appropriate facility to take him. Soon after the lynx arrived at the Museum, a competition was held among Central Oregon schoolchildren to come up with a name. “Snowshoe” won and he had been called that ever since. He is recognized for his beautiful golden eyes and bent right ear. He is thought to be a cross between Canadian lynx and Eurasian lynx. Lynx are solitary cats that hunt at night, so are rarely seen. They are stealthy hunters, with excellent hearing and eyesight so keen they can spot a mouse 250 feet away. They eat birds, mice and squirrels but prefer the snowshoe hare. Owning exotic animals, including all wild cats, was banned in Oregon in 2009.